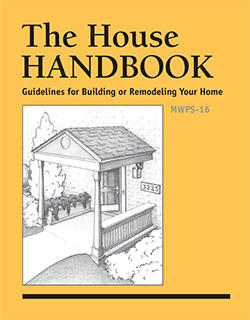 The House Handbook: Guidelines for Building or Remodeling Your Home discusses everything necessary to build or remodel a house that is affordable, attractive, convenient, efficient, and healthy. Cleaver icons point you to these concepts or practices that will help you meet the goal of developing an integrated house and landscape plan that fits a variety of life stages and lifestyles. Written by 20 experts in their field and representing 12 states. Mary Yearns was lead author, Emeritus, Iowa State University. Dozens of drawings and photographs complement the clearly written text.